The Masonry Society (TMS) will be hosting a booth, and sponsoring two technical sessions at the 2017 SEI Structures Congress that will be held in Denver from April 6-8, 2017. 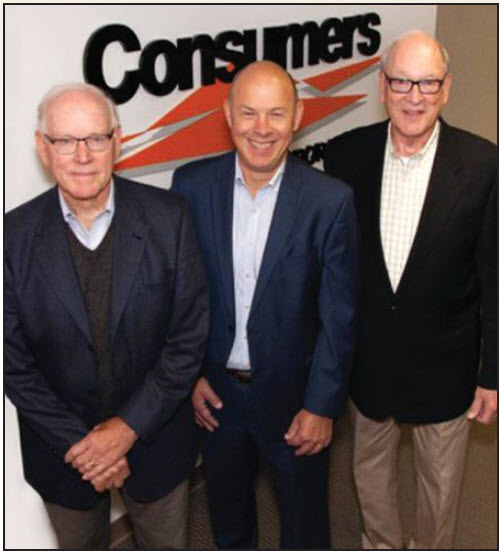 Consumers Concrete Corporation has appointed Bruce Blair as the first nonfamily member to be named president and CEO of the company founded in 1933. Owners Tom Thomas and Steve Thomas retired from day-to-day positions as CEO and president, respectively and will continue as chairman and vice chairman. The Kalamazoo MI-based company has 22 ready-mix concrete plants throughout West Michigan, two concrete block manufacturing plants, a pre-cast and redi-rock plant and four retail locations. Blair has held manufacturing, sales, quality control, research and development and marketing roles for more than 30 years in the concrete industry with Lafarge and LafargeHolcim, most recently, VP of product performance and marketing at Lafarge from 2012 to 2016. His knowledge, experience and expertise will continue Consumers’ leadership position in the Michigan markets. Blair holds degrees in geology and civil engineering from the University of Western Ontario. The brick industry has developed a PCR for its products, adopted in July and published by ASTM International. The PCR follows the general program instructions for ASTM’s Environmental Product Declaration (EPD) program. The product group includes manufactured masonry units made by forming and firing prepared mixtures of clay, shale and other materials. These are generally known as clay brick, clay pavers and structural clay tile. The full document can be found as a PDF at astm.org. 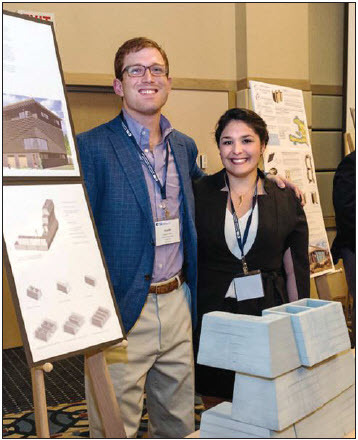 Architectural students from North Carolina State University, Smith Marks and Paola Gonzalez, took home the top honors in the National Concrete Masonry Association Foundation-sponsored Unit Design Competition during NCMA’s Midyear Meeting in Coeur d’Alene, ID. The NC State team, advised by Assistant Professor Dana Gulling, presented an innovative block design called Angle Face Block, which has a sloped front face, that could be used on its own, or paired with standard 8" or 10" CMU to create different shadow patterns. NC State and the other finalist teams from Ball State University and the University of Nebraska presented their original concrete masonry units, [inter]Block and Trapezoid Block, respectively, to block producers and others in attendance at the NCMA meetings. North Carolina State University Architectural students Smith Marks and Paola Gonzalez win with Angle Face Block. In its 16th year, the competition challenges students to design a new, innovative concrete masonry or hardscape unit that can be efficiently mass produced on a conventional block or big-board machine. This year’s competition also included teams from Iowa State University, Cal Poly State University, University of Southern California and Georgia Tech. Jurors were Laura Thompson of SPVV Landscape Architects, Spokane WA; Kevin Jester of Architects West, Coeur d’Alene ID; Ian Anderson of Anderson Masonry, Bigfork MT; and Larry Krebs of CPM/Oldcastle, Spokane WA. EK Select, a phosphate-free interior cleaner and degreaser for use on soiled stone, tile, masonry and metal panels, has earned the EPA’s Safer Choice label. The EPA Safer Choice label means that every ingredient in the product has been reviewed by EPA scientists, is safer for people and the planet, meets EPA safer product standards and is effective. Three other PROSOCO products for cleaning concrete floors have also earned the EPA Safer Choice label. Team CarbonCure, led by clean technology developer CarbonCure Technologies, has been selected as a semi-finalist in the global NRG COSIA Carbon XPRIZE competition. The team consists of Sustainable Energy Solutions (SES), Praxair, Argos, BURNCO Rock Products, several leading architects and structural engineers in the Atlanta and Calgary regions, including Walter P Moore Structural Engineers, Uzun + Case Structural Engineers, LS3P Architects, Read Jones Christoffersen Consulting Engineers, and DIALOG, with additional carbon capture expertise provided by Southern Company. The team is one of 27 semi-finalists from around the world vying for their share of the $20 million prize. 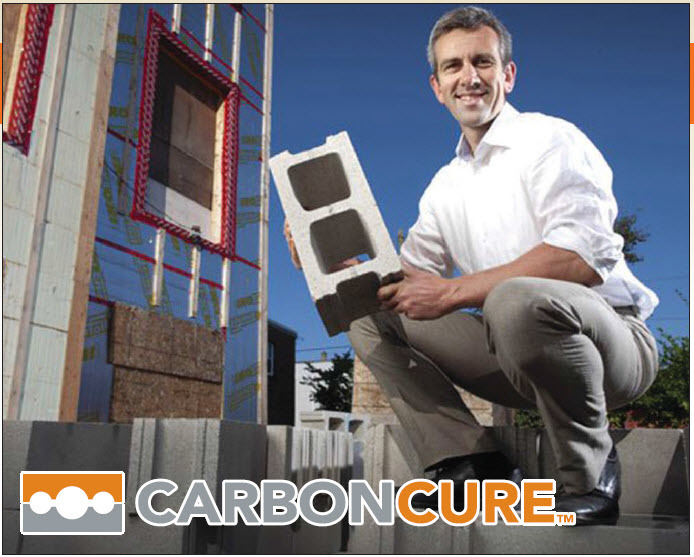 Team CarbonCure is competing in the XPRIZE challenge to demonstrate that its solution is the most cost-effective, highestimpact and most scalable solution available today to recycle carbon dioxide (CO2) to make better building materials. Carbon XPRIZE challenges teams to develop breakthrough technologies that convert the most CO2 into one or more products with the highest net value. Co-sponsored by NRG and COSIA, the multi-year competition is designed to address CO2 emissions from fossil fuels, a leading contributor to climate change. As part of the XPRIZE competition, Team CarbonCure will be hosting demonstrations of its CO2-utilization technology in Alabama, Georgia, Wyoming and Alberta over the next four years. In addition to showcasing CarbonCure’s CO2-utilization technology, the project will feature several other innovative elements, including the demonstration of Sustainable Energy Solutions’ (SES) CO2-capture technology at a cement plant. CO2 captured will then be sequestered into ready-mixed concrete produced at Argos’ concrete plants. In later rounds of the competition, CO2 will be collected from a natural gas plant and sequestered into concrete produced at BURNCO’s main plant. Southern Company will provide CO2 capture expertise on scale-up of the technology with the National Carbon Capture Center, which Southern Company manages and operates for the US Department of Energy. Praxair, leading global industrial gas company, will provide CO2 distribution services. Born in the 1990s as an affiliate to the National Concrete Masonry Association, but separately incorporated as a public charity with its own board and governance structure, the NCMA Foundation’s growth and impact on masonry research and education has been a success story largely left untold. Thanks to the vision of several industry leaders, including giants Tony Fizzano, Fizzano Brothers Concrete Products; Harry Horn, Devening Block & and Pete Muth, Orco Block Company, to name a few, to enhance the mission of NCMA and advance the masonry industry, Bill Oberfield of Oberfield’s Concrete Products led by example with a fundraising effort that produced $6 million in restricted pledges and for an endowment that today totals more than $7.5 million! – That home run for the masonry industry was invested and is generating returns to support research and education programs. Isometric view of flexural stresses in a reinforced drystacked wall subjected to out-of-plane loading. This study investigates the flexural capacity and failure mechanisms through experimental tests and finite element simulations. Isometric view of compressive stresses of two-unit drystacked prisms with steel plates at the top and bottom. The main objective is to study the effect of the contact between dry-stacked concrete masonry units on the capacity of the prisms. So, what has been accomplished over the past 15 years? What would we have missed or delayed without Foundation funding? What’s ahead for the NCMA Foundation? The National Endowment Council under the leadership of Bill Holden, CarbonCure, is planning a new effort at doubling the size and scope of the Foundation and welcomes your input and participation in writing the next chapter to this success story. Holden can be contacted at bholden@carboncure.com. For other information regarding the NCMA Foundation, please contact Larry Medley at lmedley@ncma.org or Clare Ramminger at cramminger@ncma.org. In their commitment to continual education and advancement of their staff, Worn Jerabek Wiltse Architects, Chicago, designated July 2016 as Masonry Month inviting Scott Conwell from International Masonry Institute to give presentations on moisture and quality control. The firm gifted the staff with t-shirts to celebrate their deeper understanding of masonry construction. Worn Jerabek Wiltse Architects specializes in affordable and market rate multifamily and senior housing and often utilizes masonry to design attractive and durable buildings for its clients. 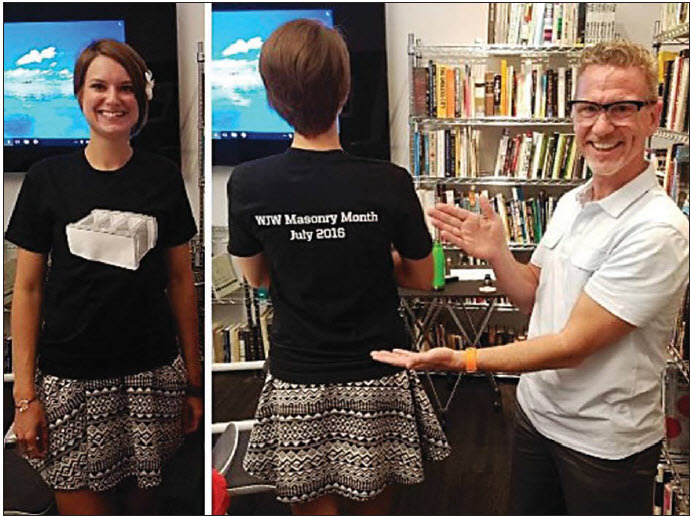 As spotted on LinkedIn by publisher of SMART | dynamics of masonry, architect Alexis Stumpf, Worn Jarabek Wiltse Architecture, and Scott Conwell, FAIA, IMI, show off a t-shirt celebrating WJW Architects Masonry Month.